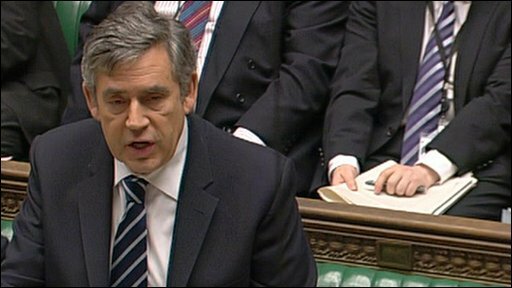 Prime Minister Gordon Brown has said the government is doing all it can to help flood victims in Cumbria to return home as quickly as possible. He was urged by Conservative leader David Cameron to ensure that everything possible was done. Mr Brown told MPs that military engineers were assessing whether they could put a temporary pedestrian bridge across the River Derwent. He pledged that the government would fund road and bridge repairs. Speaking at prime minister's questions, Mr Brown paid tribute to Pc Bill Barker, who died in the floods, and to members of the armed services and emergency workers who had been dealing with the aftermath. He said those affected by the floods would "have our support, now and into the future". Mr Brown said 40 people were believed to be in temporary accommodation. Talks with the insurance industry were under way to ensure people were either able to return home or be given alternative housing. Mr Brown said legislation to improve flood management would be brought before the Commons before Christmas. Mr Cameron joined in paying tribute to Pc Barker, who was swept away when a bridge in Workington collapsed on Friday. Cumbria escaped fresh flooding overnight as river levels started to fall. The Environment Agency said there are two flood warnings in place in Cumbria and two flood watches. Across England and Wales a total of 15 warnings have been issued. In Scotland, there are six warnings. Cumbria County Council, which maintains some 1,800 bridges, said teams of engineers were doing visual checks on them. A spokesman said they would have to wait for the waters to recede before full structural checks could be carried out. The Calva Bridge over the River Derwent - which normally links the north and south sides of Workington - has slipped by more than 1ft (30cm) since last week. High tide is due there at 1715. The county's chief area engineer, Jim Smith said: "My money would be on the fact that this bridge will either collapse or need to be demolished. "The bridge foundations have washed away and that has resulted in it actually dropping. "There's a dip in the handrail and street lighting columns are leaning over by 15 to 20 degrees." Mr Smith said the Royal Engineers had been measuring a possible site for a footbridge upstream of the Calva Bridge. The Highways Agency said it had checked the 90 bridges for which it is responsible in the county - on the M6, A66, A590 and part of the A595 - and they were all sound. 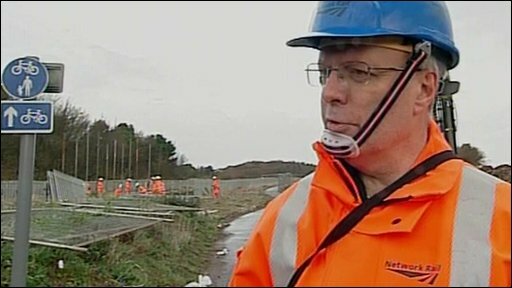 A temporary railway station is being built on the north side of the river to make in easier to travel between the parts of Workington north and south of the River Derwent using the surviving railway bridge. The two-platform station, linked by a footbridge, should be ready by the weekend. After the collapse of Northside Bridge, in which fibre optic and copper cables were swept away, BT engineers have begun installing a network using a nearby railway bridge. They expect to restore phone services to about 1,500 homes in the Flimby, Siddick and north Workington areas by Friday night. BT says it will soon start tunnelling beneath the River Derwent to provide a new route for cables threatened by the possible collapse of the Calva Bridge. In Cockermouth, the company has been cleaning the underground network and has laid on temporary phones for businesses which have been forced to relocate. The Archbishop of York, the Most Reverend John Sentamu, was due to inspect flood damage in Workington and Keswick and meet local people. Do you live in a flooded area? What are conditions like where you are? Send us your stories and pictures. Send your pictures to yourpics@bbc.co.uk, text them to 61124 or if you have a large file you can upload here.